Riding a horse 100 miles is the apex of horse endurance achievement? A couple weeks ago in the Palm Beach Post, I read an article about a Wellington (Florida) woman who rode a horse 100 miles in a competitive event. I wasn’t all that impressed. It took her and the horse 14 hour or so hours. I did my first bicycle century in less time and I’m sure I was in worse shape than her horse. Is that time an anomaly? Certainly I can’t be faster than a horse, right? The American Endurance Ride Conference, the governing body for long distance horse riding, posts scores online. The best score I could find in 2008 over a 100-mile distance was 8:41 for Carol Giles riding SAR Tiki Stranger. That comes out to about 12 miles an hour. I’m still not impressed. This coming Sunday, I’ll be riding the 2008 South Broward Wheelers Century Ride. My goal for this ride is to finish in less than eight and a half hours. If I make that goal, I will consider myself superior to a horse in terms of endurance distance riding. Anyone else up for taking on a horse? James ‘Fast Jimmy’ Watt was in marketing and wanted to sell steam engines. He did some math on the back of a flour sack and decided that a pony mule working in a mine could do a certain amount of work. He then guessed that a horse could do twice that amount of work. Based on that, he decided that a horse could do 33,000 foot pounds of force per minute. Thus, horsepower was born. Based on Fast Jimmy’s analysis one horsepower is about 746 watts. An average cyclist in good shape can produce 200 watts for hours at a time. A top-level professional cyclist can generate 500 watts. All else being equal, a horse produces two to four times more horsepower than a cyclist. Gears and efficiency, mostly. Possibly SportLegs. No, mostly gears. While cyclists are human, their bikes are machines. A great cyclist can translate about 20% of his energy into power. The rest is wasted. Given that a horse is starting out with so much more raw power, you gotta wonder how efficient a horse is at converting energy to power. I guess you also have to wonder how far and fast horses could go if they road bikes. Cyclists also aren’t bound by the rules of PETA. We are allowed to abuse ourselves long past the point where the average person would consider it cruel and unusual. The next time you ride a century, please let me know how you did versus your friendly neighborhood horse. Certainly you have never ridden a horse, much more ridden a horse for 14 hours. Well, its like riding your bike down the middle of the rail road tracks for 100 miles. I have ridden a horse. The steering is iffy at best. Brakes are problematic. I’ll bet on the bike. 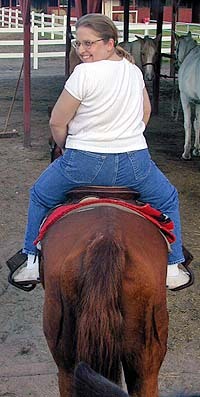 So, PM, you’re saying it is the rider that is the wimp, not the horse? I’m not so sure. Pony Express stations were ten to 15 miles apart because that was determined to be the longest distance a horse could travel at its fastest sustainable speed. The Pony Express covered 250 miles in 24 hours — less than 11 miles an hour even with having the horses and riders swapped out regularly. All told, the more I read about horses as transport, the more I like my bike. Horses have neither the stamina or speed of me on my bike. I think it must be a lot easier to ride a bike 100 miles than to ride a horse 100 miles. I did the South Broward Century in about six hours (saddle time). My average was 17 miles an hour. Aaron Writes: I happened across your post about horses vs bikes over 100 miles (October 27, 2008) and just wanted to point out that although the horse has more power, it has a lot more mass to move than a cyclist on a bike (ie. a horse weighs a LOT more than a cyclist), so although gears are great, weight is the big factor for the higher power requirement. (Another example: an 18-wheeler has many times the power of your average car but would lose in a race.) No criticism intended, just supplying info. He is, of course, accurate. Maybe we should put a horse on a bicycle and see what it could accomplish? Maybe a horse on a bicycle using SportLegs? We have pedicabs in our CityPlace area in West Palm Beach. Matt’s been bugging me to go down and shoot them. He’s even talked about trying to convince one of the riders to let him take a shift so he can experience it. One of the pedicab riders has an artificial leg, but it doesn’t seem to slow him down. Just wondering if you could still keep your time in 10 inches of desert sand, or on a rock face? I’ve ridden my horses up mountain trails, I can barely walk on. In fact I fell with only two legs to hold me up. Angela, in 10 inches of sand or on a rock face mountain trail, you are probably correct. Fortunately for me, mountains are few and far between here in Florida and I’m not one for the beach. It’s been years since I’ve done any horse riding. I’m lousy at it. Part of the reason is that I feel sorry for the horse when he’s sweating his way up one of those steep trails with me on his back. Power to weight ration is the key here. I doubt a horse puts out near the power to weight ratio as a human on a bike. 5h 17m personal best on 100 mile road course. I’ve done the mohican valley 50 mi mtn bike race in 5h 40m, and I dare to say no horse would even come close to riding that course in that time. They’d end up having to put the horse down because it would probably break a leg. Any consideration that the horse can’t coast? I just saw this so sorry for the late post. Being both an avid bicyclist(my last century I averaged 17.9 mph)and an equestrian I find this comparison ridiculous. First, you are comparing a man with a machine(bicycle) to a man riding an animal. The typical horse is carrying 20% of his body weight on his back in cargo and using only his legs as a method of propulsion. The man is using a machine with gearing advantages and more than likely a bike fitted to him. You say you are not impressed. Well you should be. Riding a horse for 100 miles is more grueling on the man and the horse than riding a bike for 100 miles as I know from experience. Your emphasis is on speed. If you want to compare apples to apples (or horses as it were)then you would need to walk or run with 20 percent of your body weight on your shoulders for the given distance an then make your comparison as then you have no mechanical advantage. I assure you the horse would win and with no complaint. I applaud anyone who has completed a century on bike or beast but you might as well be comparing the velocity of an arrow to that of throwing a rock. Or perhaps chucking a spear to firing a rifle. I mean no disrespect but if you are going to make comparison make them on a level playing field. My bike at distance is faster than my horse(one the road) and my motorcycle is faster than both. The comparison is pointless. Not completely pointless. It sucked you in to read and comment on it.